Irvine Welsh made his reputation with both the novel and the filmed version of Trainspotting, with the latter creating the cinematic language that has been borrowed by every adaptation of his work that’s followed. 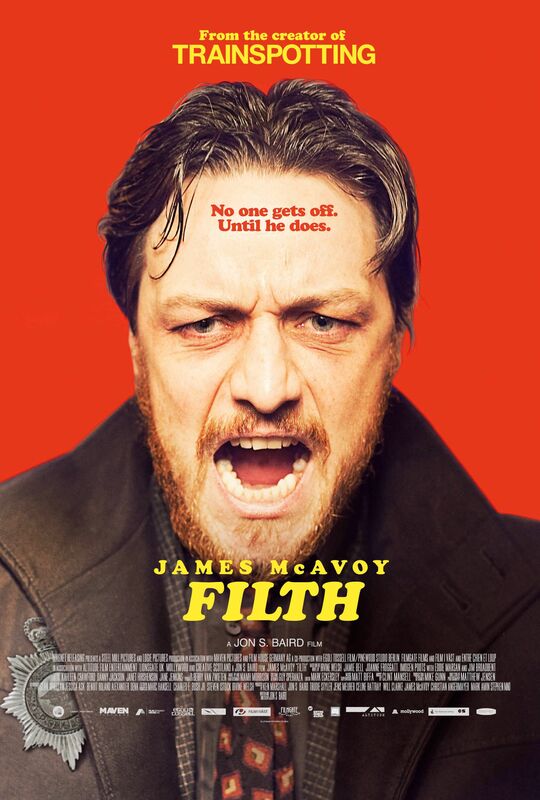 The most recent big screen Welsh adaptation is Filth, which was written for the screen and directed by Jon S. Baird and stars James McAvoy as Detective Bruce Robertson, a corrupt cop who’s got some issues at home and in the workforce. But where it has some of the flash of Trainspotting, it seems more like a Chuck Palahniuk adaptation, replete with a terrible third act twist. My review of the Filth Blu-ray follows after the jump. The film opens with Bruce’s wife Carole (Shauna Macdonald) who suggests that she loves her husband, but hopes that by teasing his desires he will become the next Detective Inspector. She then she goes out for the night and witnesses a group of kids beating a Japanese tourist to death. Bruce is assigned the case along with his coworkers, all of whom are also up for the job, and so Bruce not only wants to solve the case, but knock down his competition a peg or two. He’s closest with Ray Lennox (Jamie Bell), who he’s oftened partnered with, which works for them as both like to partake in coke and whores. There’s also Peter Inglis (Emun Elliot), who Bruce thinks he can knock down a peg for his metrosexual qualities, Dougie Gillman (Brian McCardie), who thinks he can get to reveal his inner Nazi, and Amanda Drummond (Imogen Poots), who he thinks is just getting ahead because she’s a woman, and will soon leave the force for motherhood. When the film is about this terrible person pulling strings to get ahead, it’s actually pretty entertaining, but we see that Bruce is also seeing a shrink (Jim Broadbent), who prescribes him medicine. And when Bruce goes off his meds, things get immeasurably worse for him as he starts seeing visions of dead children, and himself and others as barnyard animals. He’s also “friends” with Clifford Blades (Eddie Marsan), but his friendship also comes with him prank calling Cliff’s wife Bunty (Shirley Henderson), stealing his money and generally treated him like crap. Though the investigation seems to be wrapping up easily, and Bruce is the front-runner for the job, his mental illness takes over and after a trip abroad doing all the worst things he can think of to Cliff, his grip on the world begins to fall apart as it’s just as apparent that his wife no longer lives with him. 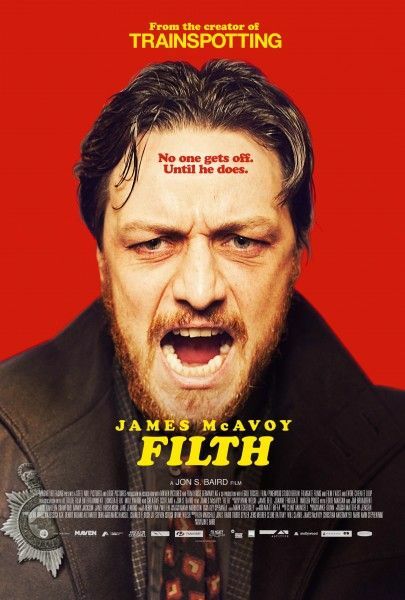 Filth ends with a big reveal, which is set up properly by the film, but it’s hard to say that the film doesn’t feel like it goes off the rails even if it’s set those rails up. The problem with going all Fight Club or Sixth Sense with a last minute “a-ha” is that it needs to be a good twist, one that makes you rethink the movie or deepen your appreciation of it, and though it’s obvious that things are amiss even before you might start putting pieces into place about what they might exactly be, when the reveal happens it comes at a point where you could care less. And though the film is about a terrible character who does horrible things, he’s at least fascinating while he does them. As film director Jean-Pierre Melville once said “people who are good at their jobs are always compelling” and as long as the character is actively pursuing his goals, it’s fun to watch, but at a certain point, he just becomes a terrible person who does mean things for no reason and he stops doing police work. The film wants you to dislike him for it, but then also have sympathy for his psychic break, which is near impossible because we don’t know the good version of the character because we can’t due to the nature of the reveal (though that may or may not be why the character has become so unhinged of late). The further the character falls down, the less interested the film is in his initial plans, and so even the pleasure of watching a terrible person succeed are gone, which then makes the big reveal all the more eye-rolling. It also removes whatever commentary the film might have about the police force and the corruption and whatever terribleness the film suggests is allowed to fester when people have power over others because the movie proves it’s not really about that. It seems reduced to being about an ill-conceived twist, the sort of thing that might work better in a novel, but does not work on screen. Director Jon S. Baird starts the film with a playful snap and visual gimmickry, but eventually too that wears thin. Baird does have a good handle on working with actors, which means you get the best out of McAvoy and someone like Imogen Poots, but most of the performers are stuck in one dimensional characters, which means someone as marvelous as Eddie Marsdan can do little but be a one-dimensional bullied schmuck. Magnolia presents the film on Blu-ray in widescreen (2.35:1) and in DTS-HD 5.1 Master Audio, and the transfer is excellent for what it is. The film comes with a playful commentary by Baird and Irvine Welsh, and also comes with eleven deleted, extended and alternate scenes (24 min.) which were wisely cut, along with outtakes (8 min.). There’s an “On the Set” piece (4 min.) 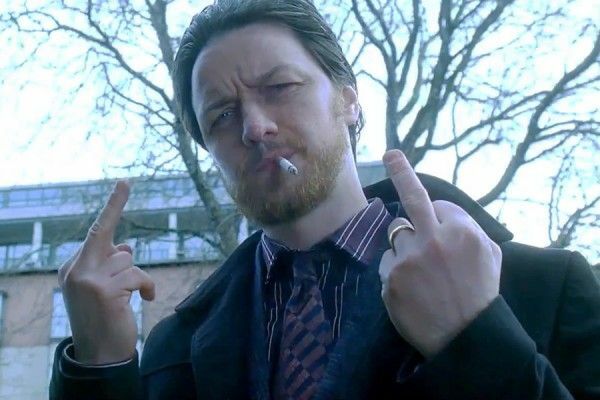 and “James McAvoy as Detective Bruce Robertson: The Antihero” (12 min.) which works as the film’s EPK worked into featurettes, with comments from the cast and crew, while “AXS TX: A Look at Filth” (3 min.) is basically a James McAvoy narrated trailer.